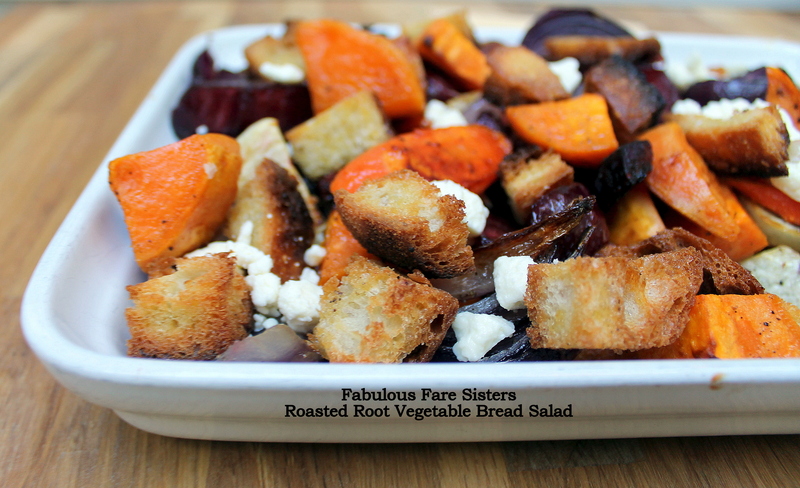 Now that we’re deep into Autumn, I love to use all those great root veggies in a salad. They’re terrific tossed in olive oil and roasted to perfection. Add some freshly made toasted bread cubes (think large croutons!) and you’ve got a great side dish for any week night meal! Heat the oven to 450°F. Position one rack in the middle of the oven and the second rack in the bottom. Place sweet potatoes, carrots and turnips in a bowl. Drizzle with a little olive oil and season with salt and pepper. Toss to coat. Spread onto a large baking sheet. Add the beets and the red onion wedges to the baking sheet; drizzle with a little more olive oil and season with salt and pepper. Roast root vegetables on the middle rack of the heated oven for 25 minutes until tender and slightly caramelized. Meanwhile place the bread cubes in the same bowl you tossed the veggies. Drizzle a little more olive oil on the bread cubes and season with salt & pepper. Place on a smaller baking sheet and roast on the bottom rack of the oven for the last 8 minutes of the cooking time. 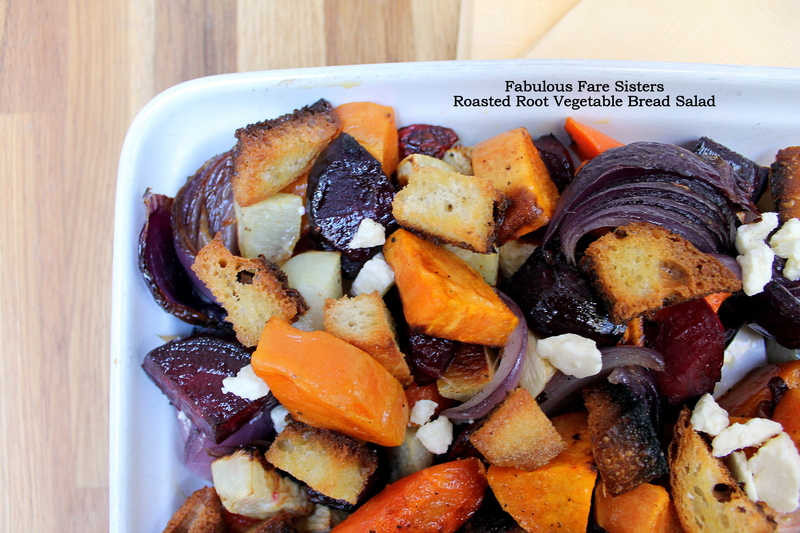 Bring both baking sheets out of the oven and toss veggies & bread together. Place in a serving bowl, sprinkle with feta cheese and eat! This recipe has been shared on Family Joy Blog Party, Throwback Thursday, FoodieFriDIY and Funtastic Friday, along with Saucy Saturdays…go check it out and then go visit some other great sites! Love your blog, love your recipes! I am glad I found you! Love this. Colorful and comforting salad! Miam, miam! I would love this as I love roots veggies especially those you added to this dish. You had me at “bread”. Lol. This looks spectacular and fairly simple!!!! What an awesome fall dish. LOL. You know all my favourites! 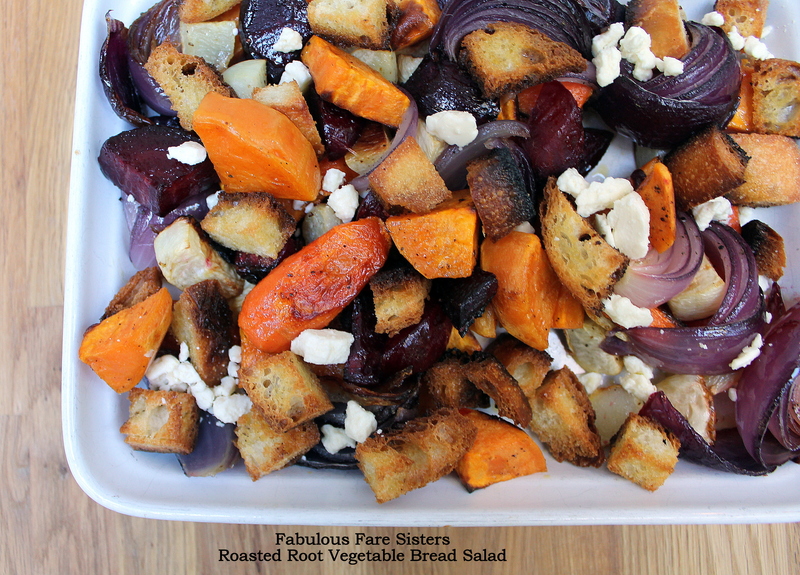 I love bread salad but hadn’t thought of a root veg variation. Perfect for the weekend that’s in it!